The health benefits of Cassia Essential Oil can be attributed to its properties like anti diarrhoea, anti depressant, anti rheumatic & anti arthritic, anti viral, circulatory and stimulant. The essential oils of balsam, black pepper, caraway, chamomile, coriander, frankincense, ginger, geranium, nutmeg, rosemary and some citrus oils blend well with the Essential Oil of Cassia. ​History:The scientific name of Cassia is Cinnamomum Cassia. It is also known by two other botanical names, Laurus Cassia and Cinnamomum Aromaticum. This evergreen tree is native to China and Burma. This plant is commonly known as Chinese Cinnamon and its bark is actually used flavour food and beverages, just like original Cinnamon. Anti Diarrhoea: The Essential Oil of Cassia has varied benefits on the digestive system and being an anti diarrhoea agent is one of them. It can be used to bind bowels and stop diarrhoea. Being an anti microbial agent, it also cures diarrhoea caused due to microbial action. It inhibits the microbial growth and stops diarrhoea. Anti Depressant: The effect of this essential oil fights depression, uplifts mood and induces warm feelings. Anti Rheumatic & Anti Arthritic: Being a circulatory and a stimulant, it improves circulation of blood and brings warmth to the joints and other parts affected with rheumatism and arthritis, thus giving relief from them. Circulatory: Improves circulation of blood and thereby facilitates distribution of nutrients and oxygen to all the body parts. This property is also beneficial in fighting rheumatism and arthritis. Stimulant: It stimulates body functions, metabolism, secretions, discharges, circulation and also the nervous system and the brain, thereby helping to be more active and alert. Caution : While there are great benefits of using cassia oil, the oil is extremely strong. Consult your doctor and a professional aroma therapist. Usually, this oil is not used in aroma therapy as it may cause irritation to your skin. However, since it has excellent anti rheumatic properties, some aroma therapists use it for treatment of arthritis pain by mixing a very small quantity in some carrier oil such as lavender essential oil or olive oil. Cassia oil also helps in stimulating blood circulation. 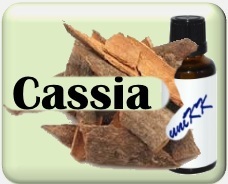 Emotionally, Cassia essential oil is said to encourage a person's sense of self, inner strength, and courage. In this way it may be helpful to support a person's confidence, ability to "put themselves out there", or try new things as they feel self-assured in their ability and worth.